(LAS VEGAS – MARCH 14, 2013) – Soon to become the world’s largest gay nightclub, Krave Massive will mark its official grand opening in Las Vegas on Saturday, June 15, 2013, just in time for summer vacation season. 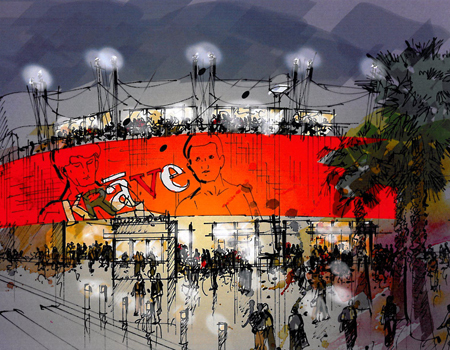 Krave Massive’s parent company Phantom Entertainment, LLC has also announced that a group led by Tony Hsieh’s Downtown Project has taken a minority equity stake in the brand. Phantom Entertainment also owns and operates Krave at the Rio All-Suite Hotel & Casino, Drink & Drag Lounge, Boys Social Lounge and GayLV Magazine. In addition, Phantom Entertainment has announced an exclusive partnership with Caesars Entertainment Las Vegas Resorts. Krave Massive club-goers may book “The Massive Package” at Caesars Palace or Flamingo Las Vegas. “The Massive Package” provides club-goers a number of benefits, including room accommodations, two resort spa and health club access passes, free admission for two to Krave Massive, as well as shuttle service to and from the resort to the club. For pricing or to purchase “The Massive Package,” visit Caesars.com. The enormous 80,000-square-foot venue will present party-goers with five themed dance rooms, each marked with its own individual design and state-of-the-art sound system, LED lighting, high-tech laser equipment, high output CO2 blasts and huge video walls. It will also feature three separate bars, a martini lounge, a members-only VIP lounge, a gay comedy club, a performing arts theater, a retail store, a multi-purpose room, a lesbians-only dance lounge and Guest House Theaters, the country’s only LGBT movie theater, which will be run by leading film production and distribution company Guest House Films. Much like its sister club, Drink & Drag – the country’s first drag queen bowling alley, which opened last May, Krave Massive is expected to also become a major draw for downtown Las Vegas and will be opening on the third level of Neonopolis (450 Fremont St.), neighbored by recent tenants that include the Heart Attack Grill, Denny’s on Fremont, Rockstar Tattoo and the recently announced Liberace Museum. Prior to relocating, Krave’s award-winning service and nightlife experience on the Las Vegas Strip earned it its status as the country’s No. 1 gay nightclub. It is currently being hosted at Crown Theater and Nightclub inside the Rio All-Suite Hotel & Casino, prior to opening as Krave Massive in June. Previous: GuavaWorld Comes Out As LGBT Television Network and You’re Invited To The Celebration!